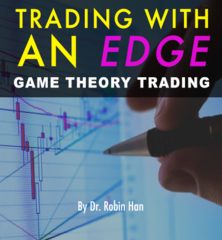 Trade with great advantage - Robin Han’s Game Theory Trading is made to improve your skills and performance significantly. Just because of this one single factor, 90% of retail investor will consistently contribute to the market. But they're never aware! What is that?? Some may say “Don’t bluff me”. But there is a fact for us to explain, why 90% -95% of retail investors are losing money over time, no matter what investment instruments they are using, stocks, futures, forex,etc. Is it because many people are not diligent enough? Yes, some may not very diligent, but we also know that many retail investors work very hard to improve their investment performance. You definitely deserve a better return with all that hard work. Have you ever felt that the market is purposely going against you, like someone is always monitoring what you do? Have you learnt tons of fundamental/technical knowledge and skills but still encounter difficulties to be consistently profitable in market (or even suffer huge losses)? Do you like these feelings and scenarios to happen again and again? Or would you like to change, become more confident and profitable in trading? If you are a new trader, do you want to avoid gaining experience from huge losses like many others do? Join me and you will see how good changes in performance can be achieved step by step. Over years of research on Game Theory and market trap, I have developed a set of skills and proprietary indicators to identify stocks at the right timing, and they've helped me perform well even when market is lousy. 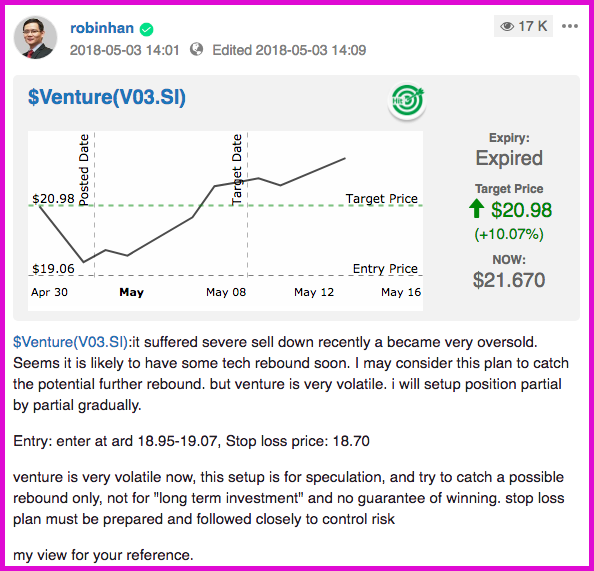 ✔ Weekly live watchlist to monitor: 5-6 stocks that may move up very fast within a week, specifically chosen based on Game Theory analysis, selected from Robin Han’s proprietary metastock scanner. Detailed trading plans will be given. Since your counterparty also wants to make profit and likely knows whatever fundamental and technical knowledge you have, Game Theory maybe the most effective tool to lower your risk, increase your winning probability. ✔ Besides picking a crucial watchlist, timing definitely is the most important factor in trading. Not only can Game Theory help to find the right stocks, it also helps you to trade at right timing, saving you from suffering a lot whipsaw or holding on to seemingly 'good stocks at a wrong price' but eventually suffer huge losses when the hidden bad news is finally announced. You will be updated on stocks in the watchlist in real-time, according to Game Theory practice to find a good entry with high probability and low risk: not too late, not too early. You will be updated on how the “Game” will change step by step and how to react according, so you can learn how to apply Game Theory in live trading. ✔ When indices (STI, HSI, Dow, S&P500, Shanghai SSE, etc) offer trading opportunities according to Game Theory, you will also be notified with a detailed trading plan in terms of index-related tools such as index futures, CFD, etc. ✔ Exclusive private group chat where Robin will share his way of doing analysis, trade planning based on Game Theory. He will also answer your questions in terms of trading according to fundamental, technical and Game Theory analysis. You are able to communicate trading skills and views with other traders/subscribers who understand the importance of Game Theory and apply it everyday. 1. It is not a “get rich quick” or “sure win” tips. You need to do the right things as what every good trader does, such as following entry and stop loss plans very closely. 2. It does NOT request you to trade only for short term. The identified stocks and setups can give you short term edge and we do expect price can move higher in short term. When you already have short term profits, it will be much safer for you to hold mid to long term if you find a company which has good value and potential. Join me as I look out for those fast moving stocks, developed from my years of experience in technical analysis, Game Theory and “market trap” analysis. These stocks are likely to have great potential and you can truly improve your winning rate. Robin Han, a graduate from NUS with a Ph.D degree, is well known by many local investors as a trader and trading mentor. 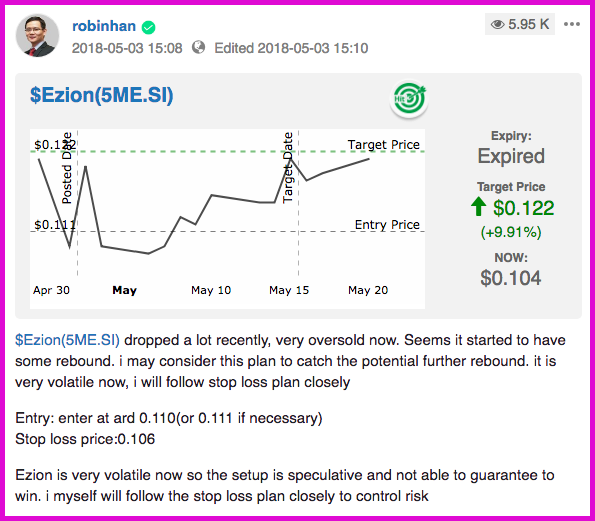 Dr. Han focuses on game theory, market trap and market timing which helped himself and his fellow traders to catch many profitable opportunities in the current volatile market. His analysis of market and individual stocks are well-known in terms of accuracy. He has broadly shared his trading experience in stock market using the combination of fundamental analysis, technical analysis and specializes in game theory analysis. He also ranked #4 out of 146 financial professionals in the SGX bull charge stock challenge. 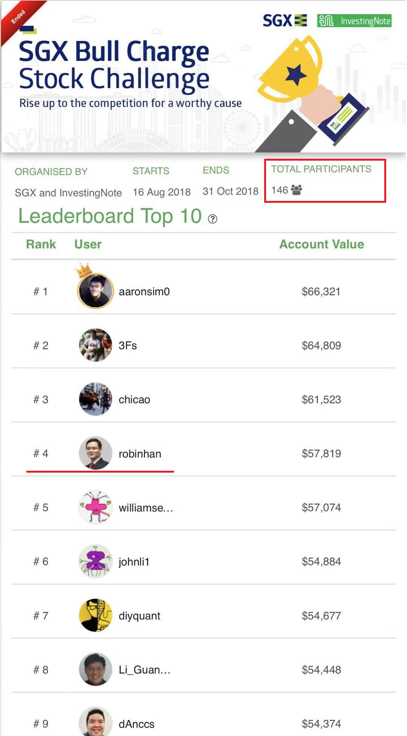 Within 2 and half months, he made a consistent profit of 15.4%, or 74% per annual, outperformed 98% of the other financial professionals and ranked #1 among all the brokers/remisiers in Singapore. Dr. Han often shares his market view and methodology through medias and organizations including: Capital 958 radio, 938 Live FM, Mediacorp Channel 8, Lianhe Zaobao, SharesInvestment, SIM BMG, Traders Round Table, Online trader’s club, RBI International, CyberQuote and Wealth Directions etc.